Glutaric aciduria type I (GA I) is an autosomal recessive disorder of the degradation of lysine, hydroxylysine, and tryptophan, caused by a defect of the enzyme glutaryl-CoA dehydrogenase (GCDH). The prevalence of GA I is 1 in 30,000. The number of diagnosed cases is, however, still low. Enzyme deficiency results in an accumulation of glutaric and glutaconic acid, which can be measured by urine testing for organic acids. Glutaric acid has a cytotoxic effect and causes cerebral atrophy and brain damage. This disorder is characterized by progressive extrapyramidal symptoms such as dystonia, dyskinesia, and choreoathetosis, often misdiagnosed as athetoid cerebral palsy. A 7-year-old boy presented with choreoathetoid movements of both upper and lower limbs with dystonia and slurring of speech since 1½ years of age. He was born following uncomplicated pregnancy. There was no history of consanguinity among parents. There was no history of birth asphyxia or jaundice during infancy. He had a history of generalized tonic– clonic convulsion following a febrile illness at the age of 1½ year. The involuntary movements started following the episode of seizure. On examination, his head circumference was 58 cm (above the 97th centile), suggesting macrocephaly. He was conscious, well oriented and was having dysarthria. There was hypotonia in both upper and lower limbs with diminished reflexes. There was the presence of generalized choreoathetosis with dystonia of both upper and lower limbs. Axial T2-weighted magnetic resonance imaging of the brain revealed bilateral frontotemporal atrophy with wide Sylvian fissure giving the “bat-wings” appearance [Figure 1]. Tandem mass spectrometry (MS) revealed increased levels of glutarylcarnitine (1.06 μmol/L; reference range - 0–0.41 μmol/L) and reduced levels of free carnitine (3.99 μmol/L; reference range – 9–65 μmol/L). Urine gas chromatography/MS showed increased excretion of glutaric acid, glutaconic acid, and 3-hydroxyglutaric acid. The diagnosis of GA I was confirmed on the basis of neuroimaging and biochemical studies. The patient was treated with riboflavin and carnitine along with protein-restricted diet especially diets lacking lysine and tryptophan. Follow-up after 3 months revealed some reduction in the involuntary movements. GA I is a disorder of lysine, hydroxylysine, and tryptophan catabolism caused by a deficiency of mitochondrial GCDH. It is inherited as an autosomal recessive trait due to mutation of GCDH gene on chromosome 19. The usual age of presentation for GA I is 6 months–2 years of life. Macrocephaly is found in approximately 75% of patients during infancy and may be an early sign before other neurologic alterations. Rarely, large head can be the only manifestation and children can be otherwise neurologically normal like our second case. They do have neuroradiographic evidence of frontotemporal atrophy. Acute neuroregression following an initial phase of normal or almost normal development is a common mode of presentation, at times preceded by seizures. The precipitating factors include febrile illness, immunization, mild head trauma, and starvation. The other frequent presentation of GA I is a chronic encephalopathy associated with choreoathetosis or dystonia  often misdiagnosed as athetoid cerebral palsy. The most characteristic finding on neuroimaging is the presence of very wide CSF spaces and open Sylvian fissures. This gives the characteristic “bat-wings” appearance and is a very characteristic finding in GA I. GA I is biochemically characterized by elevated urinary excretion of glutaric acid, 3-hydroxyglutaric acid, and increased blood glutarylcarnitine, reduced plasma carnitine, and reduced or absent GCDH activity in fibroblasts and leukocytes. Three-hydroxyglutarate in urine is the diagnostic marker compound of GA I. Treatment consists of high doses of riboflavin and carnitine along with low protein diet, especially deficient in lysine and tryptophan. The typical clinical feature and characteristic neuroimaging finding can give clue to this rare entity GA I, as seen in our patient. The delay in the diagnosis in our patient may be due to earlier misdiagnosis as athetoid cerebral palsy, which is very frequent in this disease. Early detection of this disease is very important, as diet restriction and riboflavin and carnitine therapy can limit and to some extent even reverse the neurological deficit. 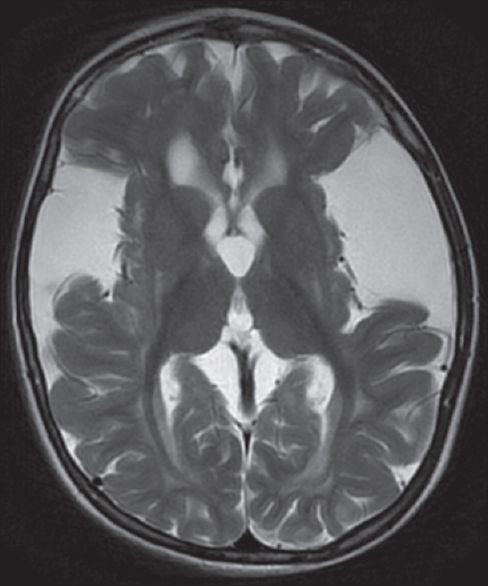 Features such as precipitation of a significant neurological disease by febrile illnesses, predominantly extrapyramidal manifestations, macrocephaly, and characteristic neuroimaging should arouse a suspicion of GA I.
Hoffmann GF, Trefz FK, Barth PG, Böhles HJ, Biggemann B, Bremer HJ, et al. Glutaryl-coenzyme A dehydrogenase deficiency: A distinct encephalopathy. Pediatrics 1991;88:1194-203. Kimura S, Hara M, Nezu A, Osaka H, Yamazaki S, Saitoh K. Two cases of glutaric aciduria type 1: Clinical and neuropathological findings. J Neurol Sci 1994;123:38-43. Bergman I, Finegold D, Gartner JC Jr., Zitelli BJ, Claassen D, Scarano J, et al. Acute profound dystonia in infants with glutaric acidemia. Pediatrics 1989;83:228-34. Kölker S, Christensen E, Leonard JV, Greenberg CR, Burlina AB, Burlina AP, et al. Guideline for the diagnosis and management of glutaryl-CoA dehydrogenase deficiency (glutaric aciduria type I). J Inherit Metab Dis 2007;30:5-22. Amir N, el-Peleg O, Shalev RS, Christensen E. Glutaric aciduria type I: Clinical heterogeneity and neuroradiologic features. Neurology 1987;37:1654-7. Nyhan WL, Ozand PT, editors. Glutaric aciduria (type I). In: Atlas of Metabolic Diseases. London: Chapman and Hall; 1998. p. 46-52.